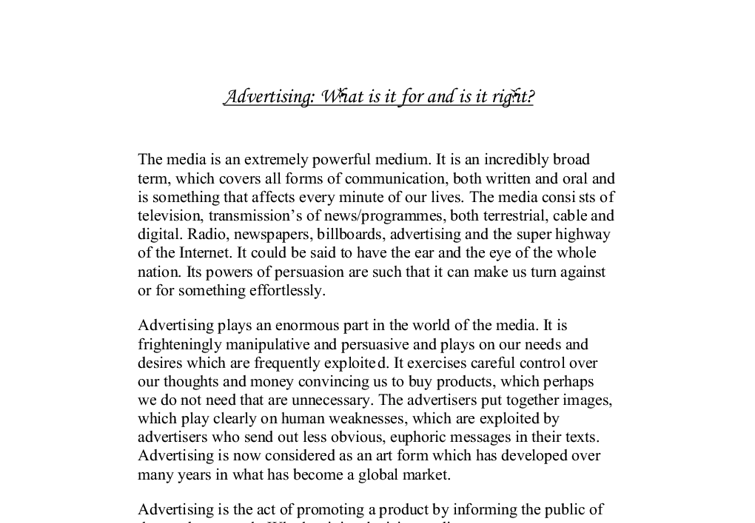 Advertising: What is it for and is it right? 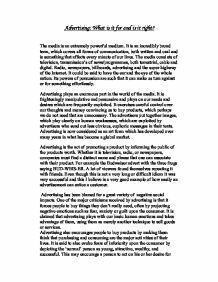 Advertising: What is it for and is it right? The media is an extremely powerful medium. It is an incredibly broad term, which covers all forms of communication, both written and oral and is something that affects every minute of our lives. The media consists of television, transmission's of news/programmes, both terrestrial, cable and digital. Radio, newspapers, billboards, advertising and the super highway of the Internet. It could be said to have the ear and the eye of the whole nation. Its powers of persuasion are such that it can make us turn against or for something effortlessly. Advertising plays an enormous part in the world of the media. It is frighteningly manipulative and persuasive and plays on our needs and desires which are frequently exploited. ...read more. Whether it is television, radio, or newspapers, companies must find a distinct name and phrase that one can associate with their product. For example the Budweiser advert with the three frogs saying BUD-WEIS-ER. A lot of viewers found themselves repeating it with friends. Even though this is not a very long or difficult idiom it was very successful and this I believe is a very good example of how easily an advertisement can entice a customer. Advertising has been blamed for a great variety of negative social impacts. One of the major criticisms received by advertising is that it forces people to buy things they don't really need, often by projecting negative emotions such as fear, anxiety or guilt upon the consumer. ...read more. In opposition, advertisers state that the public is intelligent enough to, and quite capable of, making up its own mind and will definitely not buy anything they do not want or need. People are not inclined to be swayed by false claims that they need a particular product, and will usually be very discriminating in what they take as being true, when it comes to advertising. In fact, advertisers would say that there are many positive social impacts on our society from advertising. Advertising can be used to increase awareness in society about particular issues, and in so doing, becomes a form of education. Anti drug advertising such as "It's OK to say NO", and drink driving campaigns are just two examples of how society uses the advertising industry as a means to promote public welfare. ...read more. is instantly seized and remembered; To use simple and clear fonts, such that the announcement could be read from the distance of 30-50 meters; On a hoarding it is necessary to note the nearest trading and service places where it is possible to get the promoted goods or service. * Television production: The ability to provide an exceptional line-up of shows that is both interesting and consistent with the actual needs of the citizens of Hoboken versus the perceived needs. * Target market: Dependent upon on a market that tends to be spontaneous and extremely diverse in its views. away or deleting the text message when they receive it because they think that is 'Junk Mail' * This is more difficult to increase sales and make profits because this is not a good way to attract people to buy the products. which is the printing device used by producers of professional leaflets to check their final copies before sending them for mass printing. The leaflet is in six ages, of which four are technical information about the product and its specifications. Example on January 5th 2003. e) The user can write anything on the combo boxes, day, month, year, start time , finish time and course code where all the information has been enter on the properties. f) The print out is not easy to read, the layout is all wrong and the user will not understand it. Furthermore, the article is presented in a dramatic way. The format makes the article more approachable and appealing. The paragraphs are short and keep to the point. The strong contrast pf the black and white for the headline is eye-catching and stands out. The paragraphs heading (Raging, warned) also make the article dramatic and sensational.